I have a moldy wheel of cheese under my bed. No, it’s not a long-forgotten midnight snack (although it wouldn’t be the first time). If all goes well, it will be the newest addition to my cheese-making arsenal: an aged, semi-hard Alpine cheese called a Tomme. Of course, by “if all goes well” I am referring to the problematic blossoms of gray-blue mold I found sprouting on my cheese yesterday when I pulled it out from underneath my bed/cheese cave. “Even if it’s covered in mold, in six months I’m still going to eat it,” I told a skeptical Ross and Zach as I scraped the offending rind. “I won’t pay your hospital bills” Ross muttered in reply. Don’t be fooled—I haven’t turned into a cheese-making expert overnight. Though I proudly refer to the Tomme as “my cheese,” 90 percent of the work was actually done by our cheese-making instructor Fiona during the first ever Love Apple “Advanced Cheese-Making” class. I may not be able to mold and press my own hard cheese yet, but I’ve gotten very good at adopting leftover ingredients and demos from the cooking classes to play with on my own. In fact, just yesterday the Tomme was joined under the bed by a tray with eight cubes of Fiona’s feta that are about to be brined for four weeks. Still, of all the things I’ve learned in Love Apple classes—from installing drip irrigation to brewing beer to making traditional French macarons—cheese-making is the thing I can see myself going on to do regularly. I’ve never been one to think of cooking as a science, but there’s something amazing about the fact that from the same four ingredients—milk, culture, rennet, and salt—can spring everything from a ricotta to a cheddar. It’s all in the process—making a chevre simply involves heating the milk and letting the culture do the rest, while most hard cheeses involve multiple preparatory steps and months of care. But what better way to spend a Monday morning than stirring a giant pot of warm milk and listening to New Order? With so many options I’m already looking forward to branching out–that is, if I can manage to prevent my Tomme from getting eaten alive by bacteria during the next six months. 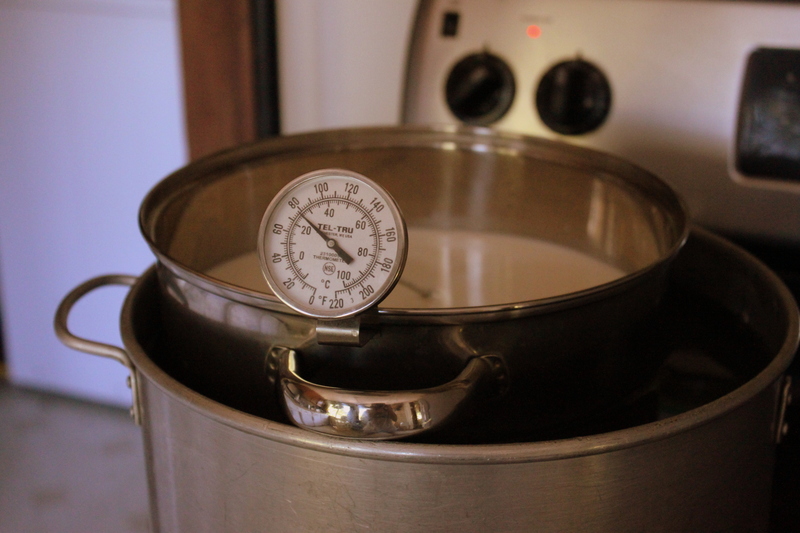 Making chevre is wonderfully easy when you have the ingredients: fresh milk and chevre culture (plus a good thermometer and cheesecloth) are really all you need. 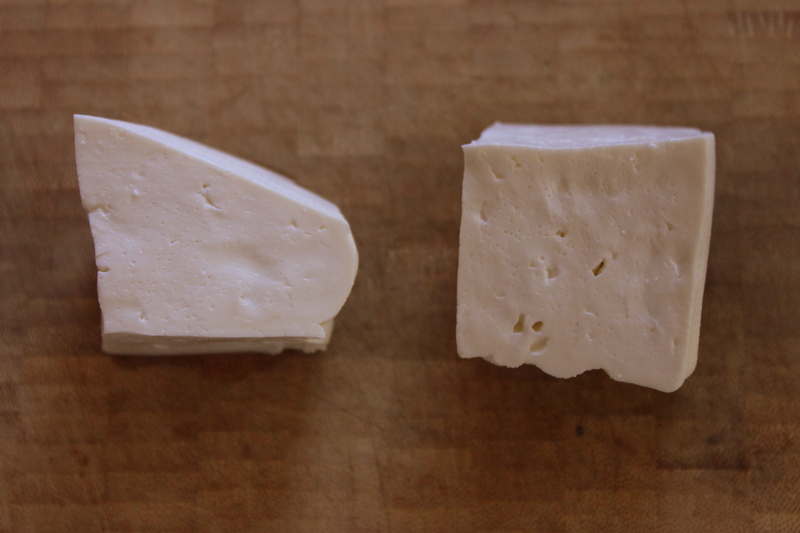 Certain brands of milk from the grocery store will work for cheese-making, and Fiona recommends looking for raw milk, or milk that has not been pasteurized and/or homogenized. That being said, finding a source of fresh goat milk can be challenging when you don’t live on a farm with goats (though you can order chevre culture from cheesemaking.com). 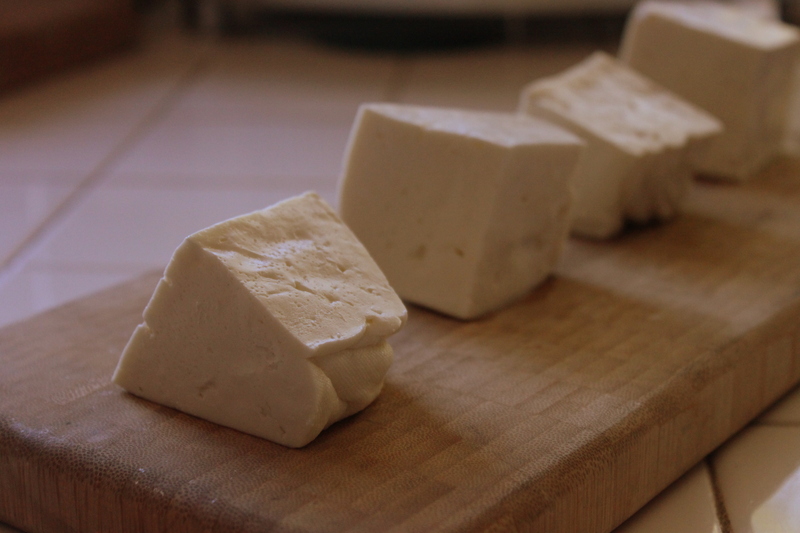 Here is the basic recipe for making chevre at home if you want to give it a try! Make a water bath by filling a large pot 3/4 of the way with water and resting the pot your milk will go into inside (ideally the handles of the second pot will keep it suspended in the water). Add your milk to the second pot and warm to 86 degrees over medium heat, stirring occasionally and checking with a thermometer. When your milk reaches 86 degrees sprinkle the packet of chevre culture over the top, waiting two minutes for the culture to rehydrate. Stir for another minute or two, then set aside covered in a warm environment for 18-24 hours (we store the pot wrapped in towels). 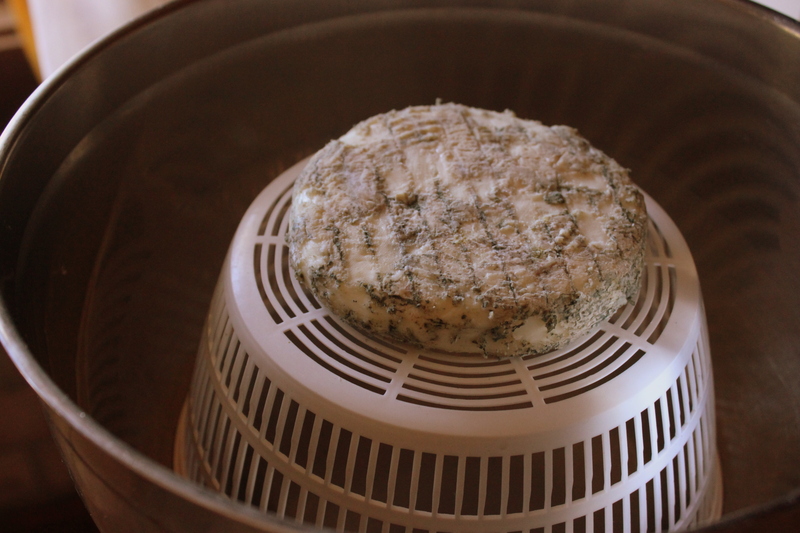 At the end of the resting period, your curds should have risen to the top of the pot, floating in a disc on the whey. Using a perforated spoon, ladle the cheese into a cheesecloth-lined colander, then tie up the edges of the cheesecloth and hang for 4-6 hours (the longer the hang, the more crumbly the chevre). Take down your cheese and remove from the cheesecloth, stir in salt to taste, and enjoy!